Golf course designers and managers should endeavor to identify and use alternative supply sources to conserve freshwater drinking supplies, promote plant health, and protect the environment. In Maryland, Class IV reclaimed water is approved for use on golf courses. MDE publishes guidelines for the use of reclaimed water. Studies of water supplies are recommended for irrigation systems, as are studies of waterbodies or flows on, near, and under the property. Water sources for irrigation must be dependable and offer sufficient resources to accommodate turf grow-in needs and ongoing maintenance. 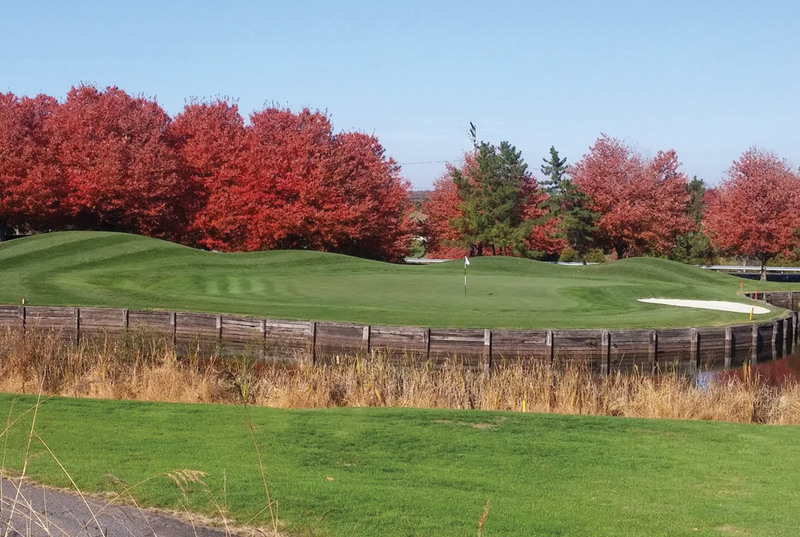 Environmental Best Management Practices for Virginia’s Golf Courses describes the methodology and provides example calculations to determine water requirements using a seasonal and maximum bulk water requirement analysis (pages 37 and 38). In addition to quantity, the water quality must be suitable for plant growth and pose no threat to public health. When necessary, sodic water system treatment options should be included in the budget to address water quality and equipment maintenance. Identify appropriate water supply sources that meet seasonal and bulk water allocations for grow-in and routine maintenance needs. Use alternative water supplies/sources that are appropriate and sufficiently available to supplement water needs and follow guidelines for use. Ensure that reclaimed, effluent, and other non-potable water supply mains have a thorough cross-connection and backflow prevention device in place and are operating correctly. Post signs in accordance with local utility and state requirements when reclaimed water is in use. Account for the nutrients in effluent (reuse/reclaimed) water when making fertilizer calculations. Monitor reclaimed water tests regularly for dissolved salt content. Routinely monitor the shallow groundwater table of fresh water for saltwater intrusion or contamination by heavy metals and nutrients. Flush with fresh water or use amending materials regularly to move salts out of the root zone and/or pump brackish water to keep salts moving out of the root zone. Amend sodic water systems appropriately (with gypsum or an appropriate ion) to minimize sodium buildup in soil. Monitor sodium and bicarbonate buildup in the soil using salinity sensors. Monitor the quantity of water withdrawn to avoid impacting aquatic species.